The Social Science Library project map:: The Social Science Library project will send free research and teaching materials to university libraries, institutions and organizations in the 138 countries shown on this map. The project is seeking Distribution Partners in all of the countries marked in yellow or green. 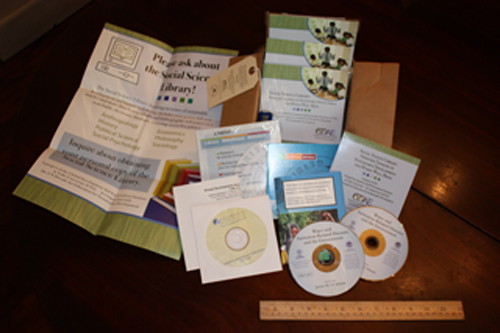 Update of June 14, 2013: Packets of multidisciplinary publications and global health DVDs have been, or will soon be, received by 53 countries. 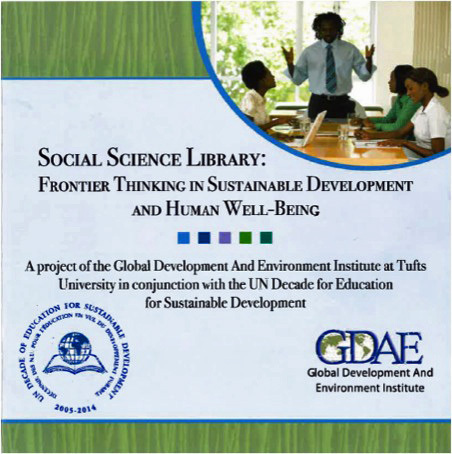 The Global Development And Environment Institute (GDAE) at Tufts University, co-directed by Dr. Neva Goodwin, has released an extraordinary collection of publications in the social and environmental sciences and global health and is now distributing it for free to universities in 138 nations, with special attention to those institutions that are most in need of library resources. The Social Science Library: Frontier Thinking in Sustainable Development and Human Well-Being (SSL) is an electronic collection of scholarly writings. This contribution to the UN Decade for Education for Sustainable Development includes complete bibliographical data (including abstracts) of nearly 10,000 entries in the disciplines of Anthropology, Economics, History, Philosophy, Political Science, Social Psychology, and Sociology. The entries include journal articles, book chapters, research reports, and working papers. Over 3,400 of the entries are full text articles that can be read in PDF form. 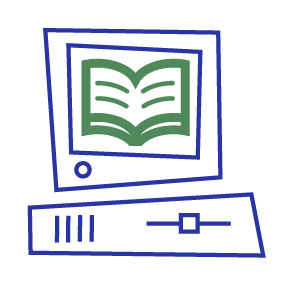 These, and the more than 6,000 additional bibliographical references, are organized and indexed for easy searching and convenient use in teaching and research. The SSL, with related materials, are being distributed for free to colleges, universities, and other relevant locations in 138 nations with special attention to those institutions that are most in need of library resources. Q: In what form do recipients receive the Social Science Library? Does it require Internet access? A: The collection is shipped on CDs and flash drives, and can be placed on computers of recipient libraries. It does not require Internet access; however an online version, with the extensive bibliography and all search and browse functions, but without the full-text articles (due to copyright restrictions), is available at: http://asitssgdae.ase.tufts.edu/ssl/cgi-bin/library.exe. If your library receives the SSL, it will come in a cardboard packet that looks like this one. : It has a wealth of material in a 10 x 10 x 5 cm ( 5 X 5 X 2.5 inches) box. Q: How widely has the SSL been distributed to date? Can individuals use it outside of the institutions that receive copies? A: As of June 14, 2013, thanks to our excellent in-country Distribution Partners, university libraries and other locations in more than 50 countries have received the materials. You can have a “library in your pocket”! And, yes, we would love for whoever, in each country, wants to have their own "library in your pocket” to bring a blank CD-ROM or flash drive to a recipient library and make a copy. The only restriction is that the materials should not leave these countries: that is what we have promised to the copyright holders who allowed us to reproduce their materials. Q: What was involved in creating this collection? What was the most difficult part of it? Is there anything you regret? A: We had a wonderful group of Tufts University students, I think there were at least 50 of them, at different times, working under my supervision along with a number of other senior researchers. During the selection process extensive review was supplied by a network of learned social scientists. The Advisory Board includes three Nobel Laureates, Wangari Maathai, Amartya K. Sen and Joseph Stiglitz, as well as other distinguished individuals such as Kemal Dervis, the former Administrator of the United Nations Development Programme, Craig Calhoun the Director of the Social Science Research Council in New York, and Ismael Serageldin, the Director of the Bibliotheca Alexandrina in Egypt. I think the hardest part was getting copyright permissions; we selected nearly 10,000 entries, but were able to get permission to reproduce only about a third of those as full-text PDFs. I regret two things: one is that the materials are all in English. Although we raised over a million dollars for the project, our resources all went to the research and to outreach to authors and publishers. Translating into other languages would have been a huge additional project, one which GDAE, quite a small organization, could not take on. My other regret, which is only a partial regret, is that this is a one-time project; we will not try to update it. I am only partly sorry for that because there are other things I want to do such as updating the economics textbooks I have written. I would have to give those up if I were going to continue with a new edition of the SSL. Q: As you conceived the project, how did you define the goals? To further the development of the social and environmental sciences in the world’s less-wealthy nations. To strengthen the ability of educated persons in these countries to influence their own local policies. To ensure that global debates on the future of the human species will increasingly include voices from all parts of the world. To give global attention and emphasis to those social science and environmental writings that are most likely to contribute to understanding and promotion of sustainability and human well-being. Q: Can you explain a little more about the thinking behind these goals? A: Sustainable development requires that the policies and activities of governments and the non-profit sector, as well as commerce and industry, be oriented to the promotion of human flourishing in healthy social and natural environments, in the short and the long run. In order to achieve these goals, it is necessary for citizens to understand the interactions among social forces, and the ways that these are affected by and affect the natural world. The multiple challenges of the 21st century will require that people in every part of the world receive education that enables them to understand and solve problems at every level, from the local to the global. While there are many good efforts to spread scientific education widely throughout the world, the social sciences have continued to be dominated, for the most part, by researchers and policy-makers in the wealthier nations. Environmental issues, which are of growing importance everywhere, also require special efforts to ensure that solutions can be designed from all perspectives, not only those of the North. Local self-sufficiency in producing and understanding social science is critical to giving people the ability to effectively evaluate programs, opportunities, policies and promises presented by powerful actors who are often remote from those who will be affected by their decisions. The cumulative knowledge and understanding available through the social sciences, from anthropology to political science, from economics to philosophy, provides hope for humankind’s ability to deal effectively with the individual and collective challenges and choices we face in the coming decades. However, the benefits from knowledge and understanding cannot be realized where there is little or no access to the existing literature. Even when access is available, it may be difficult to evaluate and select materials from the Internet and other sources of widely varying quality. The unique and outstandingly useful characteristics of the Social Science Library are selectivity, organization, and interdisciplinary breadth. Who will use the SSL – and Where? Q: You speak of people being able to have “a library in their pockets;” who are the people that you think are likely to use the SSL? Who is using it now? Correspondence with Ms. Bintou Conde, the Guinea Economic Counselor based in Washington DC, revealed that the new administration of Guinea was planning essentially to rebuild its higher education system from the ground up. Recognizing that the SSL is not only useful for research, but also helpful for faculty who are coming newly to course design, the Ministry of Higher Education and Scientific Research set in motion plans to use the SSL as the centerpiece of their future social science curricula. A: The SSL assists educators to create a wide variety of syllabi and course materials. Students are enabled with SSL material to better pursue their interests and discover new interests, as they browse the literature on their own, or follow lines of inquiry laid out by their instructors. It provides examples and materials for researchers and writers as they prepare their own observations and analyses. Policy-makers and citizens whose education has included exposure to the best social science writings, especially those that are oriented toward human well-being and sustainable development, are better able to understand their own circumstances, to assess policies suggested by foreign advisors, and to envision the most appropriate policies and choices. Q: In what countries are the SSL now available? How were these countries selected? A: We started with a list of 138 countries on which we agreed with the copyright holders who had given us permission to distribute the SSL materials. The list was drawn up in 2007 according to two criteria: income – a gross national income (GNI) of less than $6,000 per capita, as determined by the Atlas method in the World Bank World Development Indicators database; and Internet access. For example, Mexico and Lebanon each had a GNI per capita above $6,000, but were included in the list because of their relatively low Internet access. In Mexico, as of 2005, there were 118 Internet users per 1000 people, while Lebanon had 114 Internet users per 1000 people. China was not included because the copyright holders objected. We would have fought harder for China’s inclusion, except the Chinese universities with which we corresponded said that Internet is so widely available in that country that something like this is not needed. The list of countries where we have begun to and plan to distribute can be seen here at: http://www.ase.tufts.edu/gdae/education_materials/ssl_countries.html. Our materials have been widely distributed to about 34 countries on the list (marked in red). In another 22 or so countries (marked in green) some distribution has occurred or is now underway (as of June 14, 2013) but not as widely as we wish. We are especially eager to reach universities that are outside of the major centers and thus apt to have the fewest library resources. Q: Who are your partners? What do you ask them to do? Why is it worthwhile for them to take this on? A: Our in-country Distribution Partners include universities, foundations, other non-profit organizations, government agencies, and occasionally highly-motivated private individuals. GDAE works with each Partner to assist them to compile a list of potential recipients in their country, including the names and addresses, and to refine a letter addressed to the final recipients (most often these are head librarians at universities). The Partner then receives a bulk mailing from GDAE, clears through customs the carton(s) full of educational, duty-free material, and forwards the individual packets to the final recipients. Our Partners have found it worthwhile to make these efforts because they are eager to obtain the materials themselves, and recognize how valuable they will be throughout their country. They are proud to have their institution’s name prominently associated with the project. However the major motivation, I believe, is the wish to help in a broad-based educational activity, giving wide access to the Social Science Library, publications by Worldwatch Institute, the UN Research Institute for Sustainable Development, and the global health coverage in the 4-hours of multimedia DVDs that accompany the Horizon International book, Water and Sanitation Related Diseases and the Environment: Challenges, Interventions, and Preventive Measures. We are truly delighted that Horizon International is now assisting GDAE to secure Distribution Partners who can assist with further dissemination of these materials. Excellent contacts have already been made in Peru, Kenya, Liberia, Ghana and Somalia. The energy and dedication of these friends of Horizon is truly exciting. Q: Where are distribution partners still needed? Latin America and the Caribbean: 24 countries. Middle East and North Africa: 11 countries. East-Central Europe and Central Asia: 20 countries. East Asia and Pacific: 5 countries. First, please locate your country. 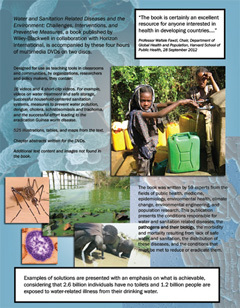 See the map at the top of this article and go to the GDAE Web site at: http://www.ase.tufts.edu/gdae/education_materials/ssl_countries.html. If the name of your country appears in red, please contact any university and ask to see the SSL materials. If you would like to copy some of them for your own use, you should bring with you blank CD-ROMs or flash-drives. Then we would like to hear from you! We will be delighted to know if you have found these materials, and if they are useful to you. If you have not found them, please let us know the name and contact information for the university where you have checked, and we will look into why they cannot be found. If the name of your country appears in black or green on the list, that means that we are seeking a partner organization in your country. 3) Forward individual packets to recipients in the country. Wiley-Blackwell, the book’s publisher in collaboration with Horizon International, realizing the tremendous value of doing so, has given its copyright permission for this purpose. GDAE’s dissemination of the material to university libraries is a one-time effort. Thus, for countries GDAE has already reached, Horizon hopes to work with the current Distribution Partners for those countries to have their assistance with providing its materials to add to the SSL they already have. If you have any questions about the SSL, including comments on how you find it of use, or suggestions for improving our outreach to others who could benefit from the SSL but may have not yet received it, please e-mail us. This article is by Dr. Neva Goodwin, Co-director Global Development And Environment Institute, Tufts University, originator of the project. 14 December 2012. Updated 14 June 2013. The 138 countries designated to receive these materials are listed at http://www.ase.tufts.edu/gdae/education_materials/ssl_countries.html.